The BlackBerry Messenger app for the Android platform was due to arrive on the Google Play Store at 7am EDT time, but it seems that the BBM for Android app release is experiencing a delay among the many fake apps that are currently available. It is now over an hour since the BBM for Android release was supposed to have happened, but at the time of writing there is still no sign of it across the world. What can be found on the Google Play Store are numerous fake apps that look genuine but are obviously not the real deal. As we reported earlier with the GTA V apps downloading and installing fake apps can be dangerous due to malicious code that could be contained in the apps, and is something that Google really needs to get on top of. Hopefully the situation will soon be resolved and the genuine BBM app for the Android platform gets released so owners can start sharing their PINs and chatting to friends or making new ones. wow RIM .. this is the Beginning 🙂 !! …you really trust this dude? I’ve heard it will download fine but BlackBerry Limited has made it virtually inactive. Messages, invites, etc. won’t work fully. until this afternoon it didnt work then RIM turned the servers on and it works perfect i have the APK file and also pictures to to proof it just tell me where to post and send them and i will prove it. It is SO annoying that Google let’s anyone throw a junk app on the play store! This is the only thing that makes me miss iOS. Someone comes to Google and says “hey, I just uhhh… made an app called Google hangouts”, Google is like “Oh sweet! I did too! High five and stick it on the play store next to mine bro!!!”. This is my problem with them. I am shocked Google doesn’t vet these, specially the paid ones as they could be held complacent in the blatant violation of trademarks, copyright and other rights and royalties. Look above, you cannot tell me using another company’s logo and name to promote your product is “fair Use” under the Millennium Act. I guess Blackberry really lives up to the expectation: delay the launch, don’t even bother to say anything about it–let alone apologize. No wonder the company is crumbling. 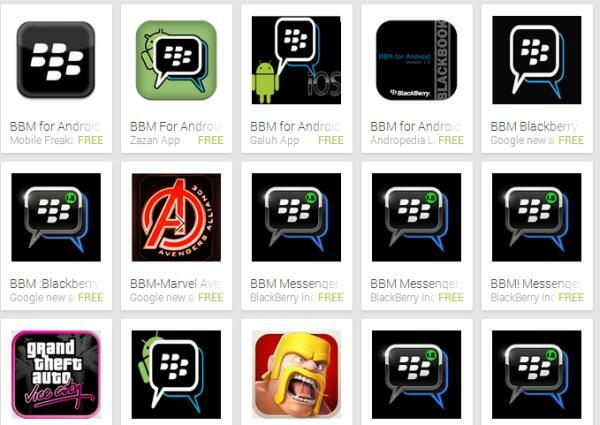 I think someone does not want bbm to run cross platform, which is why there are fake apps. Or people want to make money though deception? It’s not. It’s available on Australian, New Zealand and Indonesian App stores. Which is September 22nd over there already. All Irrelevant as i used the leaked APK file and yes it wasn’t working until today when RIM turned the servers on and now its working perfectly fine i have the apk file on a dropbox share if anyone wants it. Would you be able to send me the link?? how to identify the real authentic app ? OK listen up guys! Google are slowly taking down the fake BBM’ to make way for the official one. So I presume the official BBM will be up and running in no time. I don’t see why it won’t be ready by midnight in the UK. And the official BBM will be released by the “Blackberry Limited” team.